My Mammography Report Says I Have Dense Breasts. Should I Be Worried? 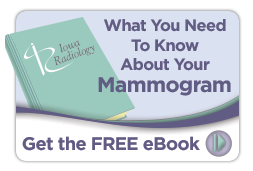 Beginning this year, all mammography reports in Iowa must contain information about the patient’s breast density and, for patients with dense breasts, information about how density relates to breast cancer risk and screening. As a result, many women are now seeing this information on their mammography reports for the first time. If you’re among them, it’s likely that you have some questions about what it means. Recent research indicates that women with dense breasts are more likely to develop breast cancer and to experience higher recall rates following mammography. Diagnosis of breast cancer in women with dense breasts has been found to identify, on average, larger tumors and more lymph node involvement than in women with nondense breasts. While this information may seem alarming at first, it’s important to put it in perspective and understand how you can use it to better protect your health. Dense breasts are very common. The first thing to understand is that having dense breasts is normal. In fact, approximately 50% of women have breasts that would be classified as heterogeneously or extremely dense. All this means is that the breasts contain a larger proportion of fibrous and glandular tissue than fat. Larger proportions of fat make it easier to identify cancer on a mammogram because it looks very different from a tumor on X-ray images. On the other hand, dense tissue, like a tumor, appears white on a mammogram, making it tougher to spot problem areas. 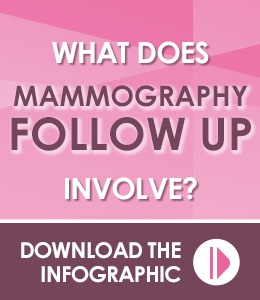 This can increase the need for callbacks after screening mammograms to obtain additional images. Getting called back after your mammogram doesn’t mean you have breast cancer. In fact, fewer than 10% of patients called back are found to have cancer. Many are called back because the views obtained don’t supply sufficient information or because the images look different from previous ones. Even when an area of interest is identified, these are often found to indicate benign conditions such as cysts or calcifications. Only with additional testing, however, can they be distinguished from cancer. 3-D mammography can help reduce callbacks and identify invasive tumors. Breast tomosynthesis, more commonly known as 3-D mammography, has been shown to reduce recall rates and improve cancer detection in women of all breast densities, but the most dramatic improvements are seen with women who have dense breast tissue. A 2014 study published in JAMA found that adding tomosynthesis to breast cancer screening resulted in a 41% increase in detection of invasive cancers as well as a 17% decrease in callbacks. 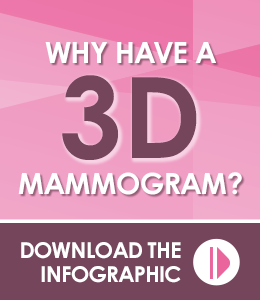 Unlike a traditional digital mammogram, which typically uses two images of each breast (one taken vertically and one horizontally), a 3-D mammogram moves the machine in an arc over the breast, takes a series of images that are digitally combined to create 3-dimensional images that a radiologist can zoom in on to examine suspicious areas more closely. 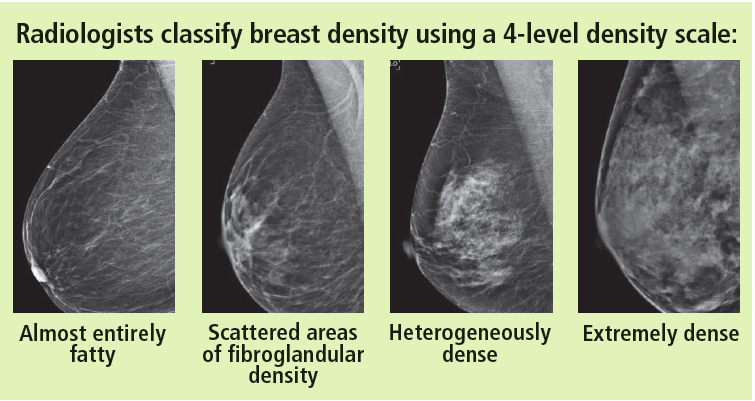 While dense tissue can block features from view in a 2-D mammogram, a 3-D image allows the radiologist to see what’s behind these tissues, making callbacks less necessary and cancers easier to spot. At Iowa Radiology, all of our mammograms are performed using breast tomosynthesis. In the event that you need follow up, we provide a whole range of breast imaging and diagnostic services, including breast ultrasound, MRI, and imaging-guided biopsy. Feel free to click any of the links below for more information about mammography or follow-up, or click here to schedule your annual screening mammogram. Moshina, Sebuødegård, et al. "Automated Volumetric Analysis of Mammographic Density in a Screening Setting: Worse Outcomes for Women with Dense Breasts." Radiology. Radiological Society of North America, 26 June 2018. Accessed 3 July 2018. "Dense Breasts: Answers to Commonly Asked Questions." Cancer.gov. National Cancer Institute, National Institutes of Health, 16 Feb 2018. Accessed 3 July 2018. "Getting Called Back After a Mammogram." Cancer.org. American Cancer Society, 9 Oct 2017. Accessed 3 July 2018. "Breast Tomosynthesis." Radiologyinfo.org. Radiological Society of North America, 13 Dec 2016. Accessed 3 July 2018. Friedewald, Rafferty, et al. "Breast Cancer Screening Using Tomosynthesis in Combination With Digital Mammography." JAMA vol. 311, no. 24, 2014, pp. 2499–2507.